Andrea has been practicing Physical Therapy since 2014. She entered into Physical Therapy school at the University of Kentucky immediately after earning her undergraduate degree in 2011 and graduated with the highest honors. Her passion for learning and for helping others fuels her dedication to provide the highest level of care to her patients. After PT school, Andrea spent 3 years working in a hospital-based outpatient clinic in Kentucky. There, she was able to help people of all socioeconomic statuses with both orthopedic and neurological diagnoses. She found that she was passionate about orthopedics and saw the amazing effects that manual therapy techniques had on her patients. 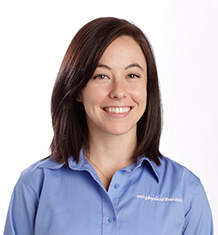 In order to continue to grow her manual therapy skills, she started working at MTI Physical Therapy and decided to pursue further training through the Ola Grimsby Institute’s manual therapy residency program. In her spare time, Andrea loves to play with her german shepherd Cozmo, work out, hike, and spend time with friends. She loves funny movies, attends a weekly bible study, and enjoys exploring the amazing Pacific Northwest!